Blog Home ❯ Mattress Tips & Tricks ❯ Does Goodwill Take Used Mattresses? Everything you need to know about Goodwill mattress donation in one easy guide. You’ve got a mattress to get rid of, but you don’t want it to end up in a landfill and you would much rather your old, unwanted mattress go to someone in need. Your first thought is to donate the mattress to Goodwill, a charitable organization that’s become synonymous with donating used goods. But, wait a second. Does Goodwill even take old mattresses? You think you remember hearing something about how Goodwill stopped taking mattress donations but you’re not really sure and you’re having trouble finding the answer online. In this article, we’ll tell you whether you can donate your old mattress to Goodwill, how mattress donation works, and what are your alternative options for getting rid of a mattress while keeping it out of the landfill and from hurting the planet. Can you donate a mattress to Goodwill? When people donate their used stuff to Goodwill, it usually gets re-sold in one of the organization’s thrift stores. Some of the money from the sale of these donations then goes to support the charity’s work in the community. Last year, nearly 300,000 people in North America were able to find employment thanks to the clothing and household items donated to local Goodwill organizations. Goodwill says on their website that although it’s hard to turn down a donation that helps to fund Goodwill programs, they do have to refuse some items. These are items that are not recyclable or that contain hazardous materials, or items that cost more to transport, repair, or refurbish than what they can be sold for in Goodwill’s stores. Unfortunately, the list of items that Goodwill cannot currently accept does include mattresses and box springs. This includes waterbed mattresses and waterbed frames as well as traditional innerspring and foam mattress sets. This is because widespread health and sanitation laws across the country would require the donated mattresses to be sanitized and refurbished before being resold in Goodwill’s stores, and as I just mentioned, this process just isn’t cost effective enough for the organization to be able to accept used mattresses at this time. All is not lost, however. Despite the current sanitary bedding laws, there are still plenty of charities and organizations across the US that you can donate a mattress to. Just because Goodwill won’t take your unwanted mattress, there are plenty of other ways to put a discarded mattress to good use. Because of the current epidemic spread of bed bugs, you might not be able to find a charity that takes used mattress donations. Many charities refuse to sell donated mattresses, but some charities will take your mattress to reuse the materials. Other charities accept used mattresses in order to recycle them. Check with nonprofit thrift stores and charities in your area to ask about their policies on taking used mattresses. Some charities, such as Goodwill, will not accept any mattress donations at all, while other organizations will accept mattress donations but only in certain locations and conditions. It’s important to remember that the charities that do take mattress donations are almost always short on space to store and house the mattresses that get donated. For example, you may have better luck donating a twin size bed than you would trying to donate a queen or a king. Larger organizations like Salvation Army and Habitat for Humanity usually do not accept mattress donations, for the same reasons that Goodwill does not take used mattresses. There are a few Salvation Army locations that you can donate a mattress to, as long as the mattress doesn’t have any stains, rips, or other damage. Call your local Salvation Army donation center and ask what their requirements are for mattress donation. It’s easier to donate a mattress when you live in a big city where there are more organizations and charities that have the resources to handle mattress donations. These charities often work with people who are in need of a mattress or bed, so the donated beds and furniture items go directly to those who need them instead of being sold in a thrift shop to raise funds for the organization’s operations. That’s why you should think about donating your mattress only ever if it is in good condition. If your mattress is stained, ripped, infested, or just generally unusable, then if you donate your mattress you’re only creating more work for the charity you donate it to. This can be a big problem, especially since that charity has to spend precious time, effort, and money figuring out how to dispose of the mattress you donated soon after you drop it off. If this sounds like your mattress, a good alternative would be to use a mattress disposal service instead. This way, you can still have your mattress recycled or donated to charity, with the added bonus of having it hauled away from your home so you do none of the heavy lifting. Instead of going through the trouble of trying to find a charity to donate your mattress to, you can book a pickup with an eco-friendly mattress removal company, like Mattress Disposal Plus, that will have your used mattress donated, recycled, or repurposed instead of dumping it in a landfill. Because they have more resources and connections than you or I do, a mattress removal company may be able to donate a mattress to a charity or find another use for it, even though you could not find a charity that would take the mattress. Mattress Disposal Plus is a professional, licensed and insured mattress removal company that will pick up your used mattress, box spring, bed frame, furniture, and other unwanted items and get rid of them for you in an environmentally sound way, such as recycling or donation. While most other junk removal companies base their prices on how much room your stuff takes up on their truck (allowing them to charge you more), Mattress Disposal Plus bases their prices on item count, allowing them to charge an average of 20-30% less than those other guys. 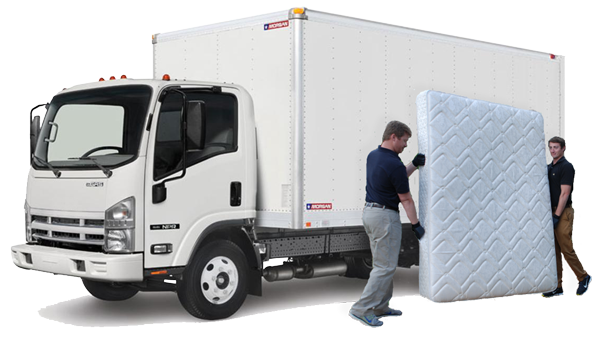 When you schedule a pickup with Mattress Disposal Plus to have them haul away and get rid of your old mattress for you, you don’t have to deal with the stress and hassle of donating or throwing away an unwanted mattress. Customers who go with other licensed mattress haulers virtually always experience sticker shock once their mattress is loaded onto the truck, thanks to dishonest pricing and hidden charges. Because they provide customers with an honest final price up front before you even book your pickup, Mattress Disposal Plus makes it easy to know what to expect and to compare prices when researching other disposal options. Mattress Disposal Plus believes that getting rid of a mattress, furniture, or other unwanted items should be stress-free and affordable for the customer. They’re transparent about their pricing because they want to make sure your mattress disposal experience is one of great value, from start to finish. If you’re still not sure what to do with that old mattress, take a look at this guide to mattress disposal for more ideas and detailed information on mattress disposal. If you’d rather have somebody do all the hard work for you, get in touch with us or book a pickup online to schedule mattress removal & disposal service.